There is a shopping mall at a congested commercial area in Karachi that I frequently pass through after parking my car at a nearby parking lot. Looking at the shops and the kind of products they are stocked with, it is easy to figure out that a majority of their customers are most probably women. But then, if you observe the people who own these shops, and the nature of the banners and posters that adorn the ceilings and the walls of the mall, one is left a tad baffled. My instinctive reaction was: what woman in her right mind would ever visit a place like this? I mean, almost all the shop owners here have long, flowing beards; they wear skull caps and an overall look that is clearly suggestive of an unbending religiosity. I always wonder whether most Pakistani women going shopping would not be a bit wary of a shopkeeper who reminds them of a Lal Masjid cleric or Sufi Muhammad’s bosom buddy. About 90 per cent of the banners and the posters in the mall are about Quyamat ki nishaniaan (signs of the approaching Judgment Day), the pitfalls of obscenity and the virtues of observing the veil. Imagine a woman trying to buy a T-shirt or a simple shalwar-kameez at a shopping mall decorated with such pearls of wisdom. It is mind boggling. Mind you, this is not the only mall that seems like a bastion of the alarmist-Islamist shopping environment. Most other shopping areas in congested urban Pakistan offer a similar charming ambiance. The primary reason for this, perhaps, is that the trading class (the economic backbone of the urban petty-bourgeois) is in one way or the other associated with either the moderate mainstream conservative parties like the PML-N or with the more Islamist parties. But more worrisome is the fact that a large section of the petty-bourgeois trading class in the last fifteen years or so has also struck cordial links with certain ultra-conservative, fringe organisations. Investigating the ideological leanings of the trading class is not the purpose of this piece. I just seek an answer to a rather simple question: How can a businessman or a trader openly exhibit an ideology that goes against his client’s or his business’s social dynamics? Why on earth would a rational businessman ever do such a thing? Last week I walked into one such shop and spent about forty minutes there. 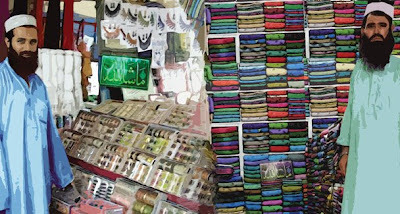 The shop-owner, a pious looking chap in his late thirties, was selling T-shirts, jeans (for both sexes) and shawls. In the time that I spent there, the shop was visited by six customers — all male. I asked the shopkeeper whether he gets any female customers as well. 'But shouldn’t there be more women coming to this shop?’ I asked. ‘Well, I think it’s due to the economic situation …’ he said. ‘Well, that’s the way it is these days,’ he explained. ‘Economy is down due to a corrupt and ineffective government!’ He added, rhetorically. ’Have you ever thought that one reason fewer women are seen shopping in such areas is perhaps because of the strictly male-dominated religiosity and ambiance here?’ I asked. ‘What’s wrong with being religious?’ He inquired, all surprised. ‘Nothing,’ I said. ‘But why be so exhibitionist and apocalyptic about it?’ I said, pointing towards a ‘Signs of Judgment Day’ poster hanging from a wall. ’I am not going to change the way I look or the way my shop looks only because some of my women clients are offended by it!’ He said, frowning. ‘Then why complain about the economic situation and political corruption?’ I said. 'Meaning?’ He asked, glaring at me. ‘Let them!’ He said, annoyingly. Now here was a trader and a businessman who was ever so willing to continue losing business because he refuses to separate his business from his political/religious views, the sort that are likely to scare away most women. Moving out of the shop, I looked at the ‘Signs of Judgment Day’ poster again. It reminded me of what a friend once told me about the Singaporean leader Lee Kuan Yew’s visit to Pakistan in the late 1970s. When asked how he saw the economic prospects of Pakistan, he replied he wasn’t all that optimistic because Pakistanis seem to spend more time thinking about the hereafter than what is to be done here and now. Well, I guess that pretty much sums it up.